Gently stir the strawberries and sugar together in a bowl. Cover and let sit at room temperature until juices release, about 1 hour. Divide fruit between 2 small, clear serving bowls or stemmed cocktail glasses. Place egg yolks, sugar, and marsala into metal mixing bowl. Set over burner on low heat. Hold rim of bowl with a potholder. Whisk until mixture forms loose peaks, 7 or 8 minutes. Mixture should feel warm to the touch. 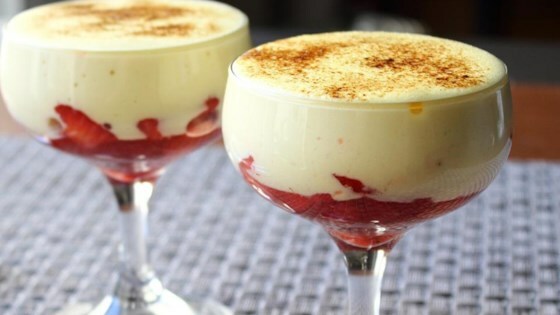 Spoon custard over the strawberries. Serve while custard is still warm. The most tempting of romantic desserts. Instead of placing the metal mixing bowl over low heat to whisk the custard, you can set the bowl over a pot of slowly simmering water. I have never made a custard before, I didn't have a metal bowl so I just used a small sauce pan. It turned out amazing! Custard tasted eggy; not sweet enough. Not very good. This is the first time I have ever made a homemade custard. I followed the directions exactly and it was delicious. I will definitely make this again.